Check the EduEnvi timeline here. You can zoom into the picture by clicking or scrolling you mouse. The main aim of the project is to modernize, improve the accessibility and to internationalize the higher education in Physical sciences and Environmental protection in Kazakhstan and Russia. 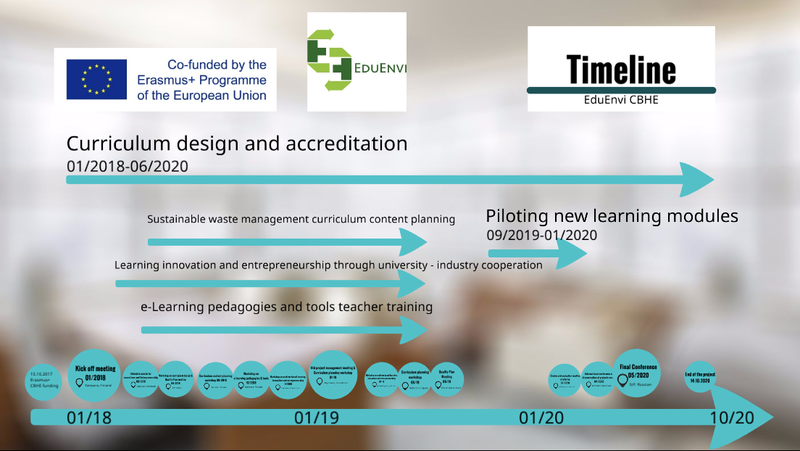 This aim will be achieved by building the capacity of the local academic staff (main target group of the project) in participating partner country universities 1) in sustainable waste management and 2) in the latest European pedagogical approaches. Additionally, eight online learning modules will be built on sustainable waste management to benefit the secondary target group, students and company/local/regional authority staff. The project started on 10/2017 and will last till 10/2020. 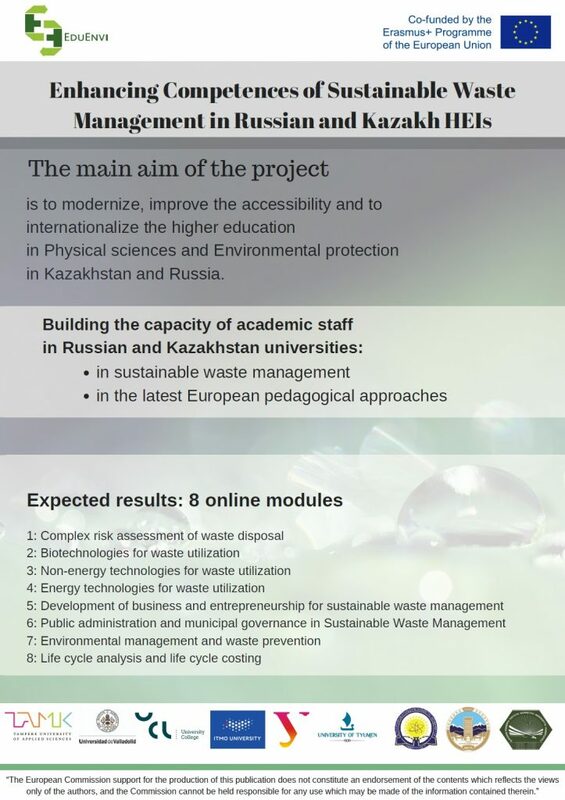 Through the training sessions the teachers from Russian and Kazakh universities will adopt the latest research, best practices, and latest technology in Europe in Sustainable Waste Management. More..
After the training sessions and peer assessment work the academic staff will be able to combine industry-cooperation into defining the competence definitions of new curricula as well as about the latest curriculum building approaches. More.. The university teachers will be able to integrate entrepreneurship and innovation methods into the learning modules. The university teachers will be able to choose the pedagogically best suited eLearning tools for each learning purpose f.ex. for collaborative knowledge building, brainstorming, feedback collection, knowledge testing. More..
Training provided for curriculum building, eLearning technology and pedagogy will support the updating of the education in Sustainable Waste Management to meet the European and global standards. The new online learning modules will offer students flexible and inclusive learning paths, the introduction of innovation methods and industry-university cooperation issues will provide students with relevant skills and knowledge needed in working life. These modules built in the project on Sustainable Waste Management will enable the education of new Master’s level professionals as well as continuous and lifelong training for persons employed by industry in Sustainable Waste Management to solve burning environmental problems in both countries. Partner countries HEIs’ closer cooperation with industry and the integration of industry-university cooperation into the learning modules will launch the development of mutually beneficial innovations and new ways of cooperation and funding in the future.